Andrew White, the son of late Gov. Mark White, made it official Thursday morning: He's running for governor, joining the crowded Democratic primary with four days to go before the filing deadline. 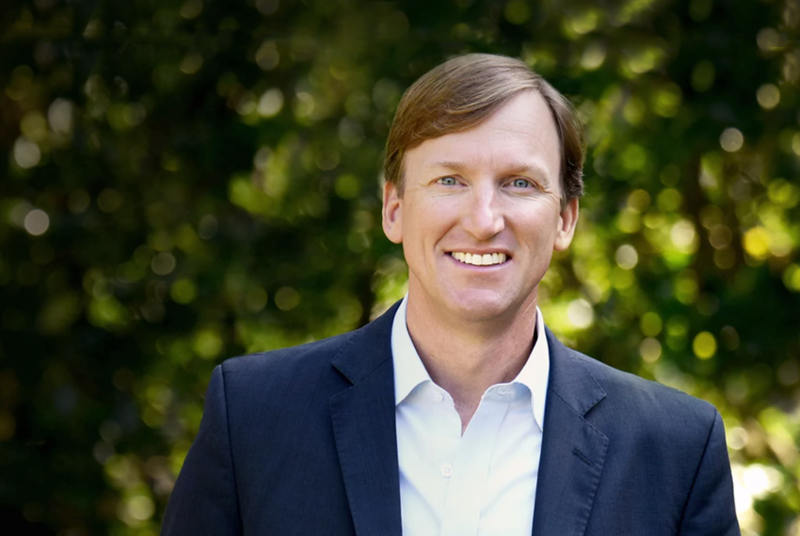 HOUSTON — Andrew White, the son of late Gov. Mark White, made it official Thursday morning: He is running for governor, joining the crowded Democratic primary with four days to go before the filing deadline. White, 45, a Houston entrepreneur who has never run for office before, pitched himself in a speech here as a "common sense Democrat" who stands the best chance of triumphing in the general election. He also portrayed Texas’ Republican leaders, including Gov. Greg Abbott, as captive to the most extreme elements in their party, leaving them unwilling to make tough decisions. Mark White, who was governor from 1983-1987, died of a heart attack in August. An education reformer, he lost re-election in 1986 after signing into law a “no pass, no play” policy that required student athletes to succeed academically to play sports. His son's announcement comes a day after Dallas County Sheriff Lupe Valdez entered the race, providing Democrats with their highest-profile candidate for governor yet. White is seen as potentially her closest competition in a contest that also features a half dozen lesser-known Democrats. Like the rest of the Democratic contenders, White faces long odds in unseating Republican Gov. Greg Abbott, who is running for a second term next year. A self-styled "conservative Democrat," White could also encounter resistance in the primary. In his speech, White repeatedly emphasized the need for Democrats to nominate a gubernatorial candidate who can claim victory in the general election. More than 100 people attended White's announcement, which was originally set to be held at the elementary school bearing his father’s name but moved to an office building lobby due to rain. The crowd included state Rep. Garnet Coleman, D-Houston, who helped introduce White. Afterward, Coleman told The Texas Tribune that he was supporting White’s candidacy because he has “has the right interests and right policies” — including on public education — and because Coleman believes White can win in November. Coleman, who is black, also explained his endorsement of White by noting, “We don’t want people to believe that the Democratic Party is against the white males — and we’re not." White’s announcement had been anticipated for weeks. As he had explored a run, he faced questions from within his party about his commitment to abortion rights, with 2014 gubernatorial nominee Wendy Davis labeling him “anti-choice” at one point. Minutes before he took the podium Thursday, Progress Texas, a liberal advocacy group, sent out a news release posing four questions for White, including whether he would sign an “anti-abortion bill” passed by the Legislature. In an interview afterward, he described himself as “deeply, personally pro-life” but argued that does not make him "anti-choice." If elected governor, he promised to respect Roe V. Wade and not push for further abortion restrictions in state law. “All of the bills that we’ve seen come out of the Legislature in recent years are bills that I would veto … and the rationale is these bills do the opposite of protecting life,” he said, explaining that the laws have only led to higher rates of maternal mortality and unplanned pregnancy. Also in the interview, White welcomed Valdez into the race, saying he is glad she is running because both of them will be drawing attention to “Greg Abbott’s failed policies.” White, a political newcomer, also expressed hope that the competition would “sharpen my edges” and make him a better candidate. Shortly after White’s announcement, the Texas GOP put out a news release accusing Democrats of “rigging another primary,” apparently in favor of Valdez. Disclosure: Progress Texas has been a financial supporter of The Texas Tribune. A complete list of Tribune donors and sponsors can be viewed here.